ISG15 is an IFN-inducible ubiquitin-like protein and its expression and conjugation to target proteins are dramatically induced upon viral or bacterial infection. We have generated a UBP43 knockout mouse model that is lacking an ISG15-specific isopeptidase to study the biological role of the protein ISGylation system. We report that UBP43-deficient mice are hypersensitive to LPS-induced lethality and that TIR domain-containing adapter inducing IFN-β → IFN regulatory factor 3 → type I IFN is the major axis to induce protein ISGylation and UBP43 expression in macrophages upon LPS treatment. In ubp43−/− macrophages, upon LPS treatment we detected increased expression of IFN-stimulated genes, including genes for several cytokines and chemokines involved in the innate immune response. The ubp43−/− mice were able to restrict the growth of Salmonella typhimurium more efficiently than wild-type mice. These results clearly demonstrate two aspects of IFN-signaling, a beneficial effect against pathogens but a detriment to the body without strict control. Interferons are well-known cytokines that play pivotal roles in antiviral, antibacterial, cell growth, differentiation, and antitumor responses (1, 2). IFNs are also considered as signals for modulating innate and adaptive immunity (3). Type I IFNs induce several hundred IFN-stimulated genes (ISGs),4 including cytokine genes, through the Jak/Stat signaling pathway (4). It has been known that Jak/Stat signaling is tightly regulated by various means and dysregulation of this signaling is associated with a variety of immune disorders (5). There are three groups of negative regulators for type I IFN and other such cytokine signaling: several protein tyrosine phosphatases (Src homology proteins 1 and 2, CD45, protein tyrosine phosphatase 1B, and T cell protein tyrosine phosphatase), suppressor of cytokine signaling (SOCS) proteins, and protein inhibitor of activated STAT family members (5). Recently, we have demonstrated that UBP43, a deconjugating protease of ISG15, is a new negative regulator of the type I IFN signaling pathway (6). ISG15 is an IFN-inducible ubiquitin-like protein and its expression and conjugation to target proteins are highly induced upon viral or bacterial infection (7, 8). The protein ISG15 conjugation process ISGylation follows an analogous mechanism to other ubiquitin-like protein modifications (8, 9, 10). However, the ISGylation system is unique among ubiquitin-like protein systems. The expression of ISG15 and currently known enzymes for ISGylation and deISGylation are all highly induced by type I IFN. Furthermore, the ISGylation system has been detected only in vertebrate genomes, whereas most ubiquitin-like protein systems are highly conserved throughout all eukaryotes from yeast to human. Thus, the ISGylation system may have specialized functions related to host defense against pathogens in higher eukaryotes. To date, three enzymes, UBE1L (E1), UBC8 (E2), and UBP43 (USP18, isopeptidase) have been identified for the ISGylation and deISGylation processes (11, 12, 13, 14). Genetic knockout studies demonstrated that UBP43 activity is not essential for the precursor processing of ISG15 in vivo because UBP43-deficient cells can generate ISGylated proteins upon IFN treatment (6). The most pronounced phenotype of UBP43 deficiency is hypersensitivity to type I IFN, with enhanced and prolonged activation of Jak/Stat signaling (6). Thus, UBP43 is another member of the negative regulators of type I IFN and the Jak/Stat signaling pathway. Type I IFNs are produced in macrophages upon activation of TLR4 signaling by bacterial LPS, a pathogenic agent in endotoxin shock (15). Although TLRs have been shown to act as primary immune sensors for invading pathogens, over-activation of inflammatory signaling often causes a lethal shock to the host accompanied by multiple tissue damage and organ failure (16). TNF-α has been known to be a major contributor to LPS-induced septic shock (17, 18, 19). In addition to TNF-α, a recent report demonstrated that type I IFNs, especially IFN-β, are central effecters in LPS-induced lethality (20). 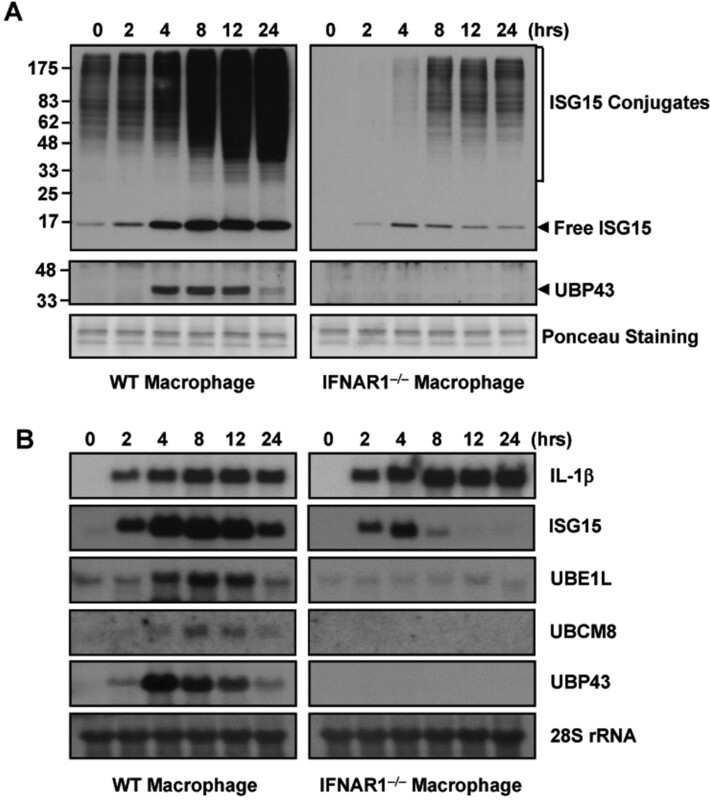 Several microarray studies showed that ISG15 is a highly up-regulated gene in human macrophages during various bacterial infections (21, 22) and both ISG15 and UBP43 were identified as LPS-induced genes in mouse macrophages (23). We questioned whether ISG15 and/or UBP43 are involved in antibacterial responses mediated by TLR4 signaling and addressed this question by using the UBP43 knockout mouse model, which is lacking an ISG15-specific deconjugating enzyme. We report that LPS-induced UBP43 expression and protein ISGylation is mainly a TIR domain-containing adapter inducing IFN-β (Trif) and type I IFN-dependent event in macrophages. We also show that UBP43-deficient mice have a higher sensitivity to endotoxin-induced septic shock than wild-type mice. However, TNF-α production in UBP43-deficient macrophages was comparable to that of wild-type macrophages upon LPS treatment. Instead, ubp43−/− macrophages exhibited enhanced and prolonged activation of Jak/Stat signaling resulting in elevated expression of ISGs, as well as IFN-inducible cytokine and chemokine genes, which indicates a negative regulatory role of UBP43 in type I IFN signaling. ubp43−/− macrophages also showed enhanced phagocytic activity to IgG opsonized yeast particles. With these characteristics, ubp43−/− mice were more capable of restricting the growth of Salmonella typhimurium than wild-type mice. These results clearly demonstrate two aspects of IFN-signaling, a beneficial effect against pathogens but detrimental to the body without strict control. The generation of ubp43−/−, ifnar1−/−, trifLps2/Lps2, myd88−/−, and myd88−/− mice harboring trif Lps2 mutation has been described (24, 25, 26, 27). ubp43−/− mice were backcrossed to C57BL/6 mice to five generations because further backcross to C57BL/6 caused embryonic lethality. Other mice were in a C57BL/6 background. Mice were housed in a pathogen-free facility and procedures were approved by the Institutional Animal Care and Use Committee of The Scripps Research Institute. To generate bone marrow-derived macrophages (BMM), bone marrow cells from wild-type and knockout mice were cultured in DMEM supplemented with 10% FBS and 20% M-CSF conditional medium from L929 cells. The nonadherent cells were collected the next day and continually cultured for 6 days for the development of BMM. For the preparation of peritoneal macrophages, mice were injected with 3 ml of 4% thioglycolate i.p. Peritoneal exudates were collected 72 h postinjection by washing with 10 ml of ice-cold PBS. Macrophages were plated in cell culture plates and incubated for 12 h prior to experiments. Macrophages were treated with various TLR ligands with concentrations as indicated in the figure legends. Peptidoglycan (Staphylococcus aureus) was purchased from Fluka, poly(I:C) from Sigma-Aldrich, and resiquimod from Novartis Pharmaceuticals. Phosphorothioate-stabilized CpG oligodeoxynucleotide (5′-TCCATGACGTTCCTGATGCT-3′) was obtained from Integrated DNA Technologies. LPS (Escherichia coli serotype O127:B8; Sigma-Aldrich) was dissolved in PBS and i.p. injected to mice at 15 mg per kg body weight. Blood and bone marrow nucleated cells were counted in Türk solution (3% acetic acid and 0.01% crystal violet in H2O). Thioglycolate elicited peritoneal macrophages (5 × 105 cells/well) were cultured on 24-well plates for 12 h and then treated with 1 μg/ml LPS. Culture supernatant was collected at indicated time points. The amount of TNF-α was measured by ELISA as specified by the manufacturer (BD Pharmingen). The phagocytic ability of macrophages was assayed by measuring uptake of Texas Red zymosan particles (Molecular Probes). Thioglycolate-elicited peritoneal macrophages (1 × 104 cells/well) from wild-type and ubp43−/− mice were plated on eight-well glass slide chambers (Nalge Nunc International) and allowed to adhere for 1 h at 37°C. Texas Red zymosan particles were prepared in PBS containing 20 mg/ml BSA, 2 mM sodium azide, and opsonized by incubating with 10% mouse IgG for 15 min at 37°C. Opsonized yeast particles (5 × 105, 50 times excess) were added to the cells and incubated for 1 h at 37°C. Cells were then washed three times with ice-cold PBS and the fluorescence from uningested particles was quenched with 0.4% trypan blue. The fluorescence of the particles in the cell was visualized using a fluorescence microscope (Leica Microsystems) with the indicated magnification. The number of particles in the cells was also counted from a total of 200 cells to get the average number of particles from each genotype of macrophages. Total RNA from BMM was isolated using RNA Bee reagent according to the manufacturer’s instructions (Tel-Test). Five micrograms of total RNA from each time point was separated in an agarose/formaldehyde gel (0.22 M), blotted on Hybond N+ membrane (Amersham Biosciences), and probed with 32P-labeled cDNAs. As an equal loading control, 28 S rRNA was detected using 32P-labeled probe (5′-AACGATGAGAGTAGTGG-3′) by hybridizing at 43°C and washing with 6× SSC containing 0.1% SDS at 43°C. For quantitative RT-PCR analysis, cDNA was generated from total RNA using TaqMan Reverse Transcription Reagents kit (Applied Biosystems) according to manufacturer’s protocol. Real-time PCR was performed with the following primers: murine (m) TNF-α (forward) 5′-ACAAGGCTGCCCCGACTAC-3′, (reverse) 5′-ACTTTCTCCTGGTATGAGATAGCAAAT-3′, (probes) 5′-TGCTCCTCACCCACACCGTCAGC-3′; mIL-1β (forward) 5′-AACCTGCTGGTGTGTGACGTT-3′, (reverse) 5′-CAGCACGAGGCTTTTTTGTTG-3′, (probes) 5′-CCATTAGACAACTGCACTACAGGCTCCGA-3′; mIL-6 (forward) 5′-GTCAATTCCAGAAACCGCTATGA-3′, (reverse) 5′-CACCAGCATCAGTCCCAAGA-3′, (probes) 5′-CTCTCTGCAAGAGACTTCCATCCAGT-3′; mMCP-1 (forward) 5′-AACTCTCACTGAAGCCAGCTCTCT-3′, (reverse) 5′-TGAACAGCAGGCCCAGAAG-3′, (probes) 5′-TCCTCCACCACCATGCAGGTC-3′; murine IFN-γ-inducible protein-10 (mIP-10) (forward) 5′-ATGAGGGCCATAGGGAAGCTT-3′, (reverse) 5′-ATCGTGGCAATGATCTCAACAC-3′, (probes) 5′-AATCATCCCTGCGAGCCTATCCT-3′; and mMIP-1α (forward) 5′-GCGAGTACCAGTCCCTTTTCTG-3′, (reverse) 5′-GGTGGAGACCTTCATGATGTTGA-3′, (probes) 5′-CTGCTGACAAGCTCACCCTCTGTCACC-3′. TaqMan probes were labeled with FAM as a reporter and Black Hole Quencher as a quencher. Thermal cycling and detection of the real-time amplification were performed using the ABI PRISM 7900HT Sequence Detection System (Applied Biosystems). The quantity of target gene is given relative to the GADPH control based on cycle threshold Ct values determined during the exponential phase of PCR. The production of anti-UBP43 Abs has been previously described (12). Rabbit anti-mouse ISG15 polyclonal Abs were generated using full-length mouse ISG15 and immunoaffinity purified as described in detail (28). Phosphospecific Abs for STAT1, ERK, JNK, and p38 were purchased from Cell Signaling Technology, and Abs for STAT1, ERK, JNK, p38, and IκBα were from Santa Cruz Biotechnology. Western blotting was performed as previously described (12). S. typhimurium 14028 was obtained from American Type Culture Collection. Overnight cultures of bacteria were freshly inoculated in Nutrient broth from BD Biosciences. The bacteria were collected in the log phase of growth, chilled on ice, and the concentration estimated from the absorbance at 600 nm using a predetermined calibration curve. For injections, bacteria were washed three times in PBS and serial dilutions were prepared in the same buffer. The number of bacteria injected was subsequently confirmed by viable bacterial counts on agar plates. Age-matched wild-type and ubp43−/− mice were injected i.p. with bacterial suspensions prepared in 500 μl of PBS. Mice were sacrificed 72 h postinfection, livers and spleens were removed aseptically, and tissues were then homogenized in sterile PBS. Bacterial counts were determined by plating 10-fold serial dilutions of liver or spleen homogenates on Nutrient Agar plates (BD Biosciences). For survival curves, mice were infected with S. typhimurium as described and monitored until terminated. ISG15 has been reported as one of the most up-regulated genes in human macrophages during various bacterial infections (21, 22). Both ISG15 and UBP43 were identified as LPS-induced genes in mouse macrophages (23). To understand the signaling pathway that induces ISG15 expression and its conjugation upon bacterial infection, we first investigated which TLR signaling pathway is responsible for the induction of the ISGylation system in macrophages. BMM from C57BL/6 mice were treated with various TLR ligands and ISG15 conjugates were detected by Western blot analysis. IFN-β treatment clearly induced protein ISGylation in macrophages (Fig. 1⇓A). The TLR3 ligand (poly(I:C)) and TLR4 ligand (LPS) also induced ISG15 conjugates to a similar extent as IFN-β. Other TLR ligands including peptidoglycan (TLR2), resiquimod (TLR7), and unmethylated CpG DNA (TLR9) did not induce protein ISGylation, although a basal level of ISGylated proteins were still detectable in those cells. Thus, TLR3 and TLR4 seem to be the major receptors that can induce protein ISGylation in macrophages. Trif-dependent activation of the ISGylation system in macrophages. A, BMMs prepared from C57BL/6 mice were treated with IFN-β (500 U/ml) and various TLR ligands; 10 μg/ml peptidoglycan (PGN) for TLR2, 0.1 μg/ml poly(I:C) for TLR3, 1 μg/ml LPS for TLR4, 1 μg/ml resiquimod for TLR7, and 100 μM unmethylated CpG DNA for TLR9. Macrophages were harvested and subjected to SDS-PAGE followed by immunoblotting against an anti-ISG15 Ab. B, BMMs from wild-type (WT), myd88−/−, trifLps2/Lps2 (trifLps2), and myd88−/−/trifLps2/Lps2 double knockout (DKO) mice were treated with 1 μg/ml LPS for 24 h and ISGylated proteins were detected by immunoblotting. 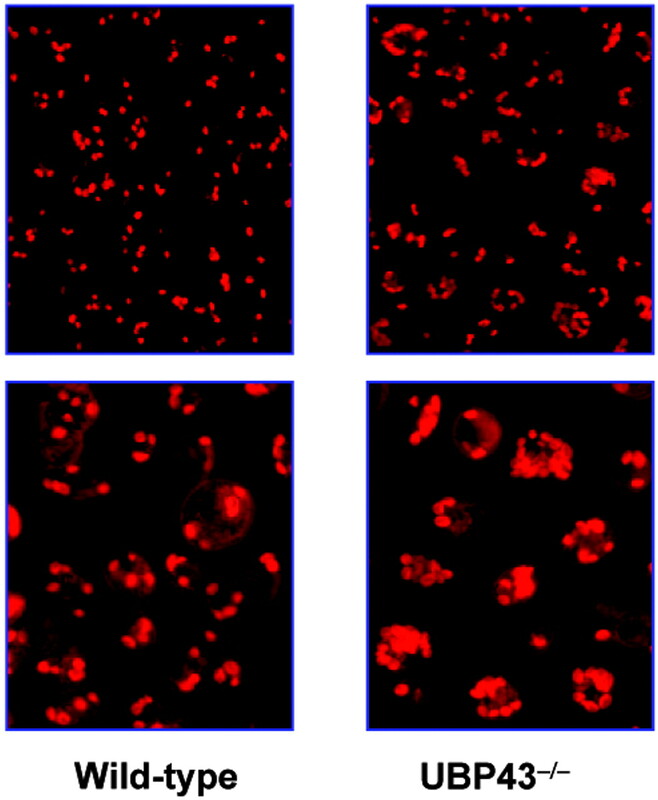 Ponceau staining was used as a loading control for A and B. C, Gene expression for the components of ISGylation and deISGylation were detected by Northern blotting in BMMs treated with 1 μg/ml LPS. A 28 S rRNA signal on the same membrane was used as a loading control. TLR3 and TLR4 are known to share overlapping adaptor proteins to transduce signals from the receptor to the nucleus (29). To identify which downstream signaling pathway is involved in the activation of the protein ISGylation system, we compared ISG15 conjugation in BMM from wild-type, myd88−/−, trifLps2/Lps2 mice that contain homozygous Lps2 alleles of Trif, and myd88−/−/trifLps2/Lps2 mice upon LPS treatment (Fig. 1⇑B). We also checked individual gene expressions for ISG15, UBE1L, and UBP43 in a similar set of experiments (Fig. 1⇑C). MyD88-deficient macrophages showed the similar levels of ISG15 conjugates and expression of the three listed genes compared with wild-type cells. Conversely, trifLps2/Lps2 macrophages expressed significantly decreased amounts of ISG15, UBE1L, and UBP43 compared with wild-type or myd88−/− macrophages, and as a result, showed only small amounts of ISG15 conjugate upon LPS treatment. Furthermore, myd88−/−/trifLps2/Lps2 macrophages did not show any LPS-induced protein ISGylation. Taken together, these results suggest that LPS induces the ISGylation system mainly through a Trif-dependent pathway. However, the MyD88 pathway still contributes to the maximum activation of ISGylation, probably by inducing as yet unknown components of ISGylation. Because Trif is an adaptor protein involved in IFN regulatory factor (IRF) 3 activation upon LPS response and thus induces type I IFN production in macrophages (27, 30), we analyzed the contribution of type I IFN signaling to protein ISGylation upon LPS treatment in BMM. We compared protein ISGylation and the expression of ISG15, UBP43, and UBE1L in wild-type and ifnar1−/− BMM upon LPS treatment. Wild-type BMM showed clear induction of protein ISGylation with LPS treatment, whereas ifnar1−/− BMM produced only very minor amounts of ISGylated proteins (Fig. 2⇓A). LPS induced UBP43 expression only in wild-type BMM but not in ifnar1−/− (Fig. 2⇓A). All of the components for the protein ISGylation system tested in this experiment, namely ISG15, UBE1L, and UBP43, showed LPS-induced expression patterns by Northern blotting (Fig. 2⇓B). However, individual genes appeared to be regulated in different ways. ISG15 reached maximum expression levels 4–12 h after LPS treatment in wild-type BMM (Fig. 2⇓B). In contrast, in ifnar1−/− BMM, ISG15 expression increased only for a very short time (2–4 h) and to a much lesser extent compared with wild-type BMM (Fig. 2⇓B). This result suggests that LPS induces ISG15 gene expression through two independent mechanisms in BMM and type I IFN signaling is responsible for expression of ISG15 at later time points. The UBE1L and UBP43 genes were also induced by LPS in an IFN-dependent manner (Fig. 2⇓B). However, UBE1L showed a basal level expression in ifnar1−/− BMM whereas UBCm8 and UBP43 expression was not detectible even with very long exposure (Fig. 2⇓B and data not shown). Taken together, the components of ISGylation system are induced simultaneously by LPS mainly through type I IFN-signaling pathway in BMM but individual genes are regulated in different ways. Type I IFN-mediated activation of protein ISGylation in LPS treated macrophages. A, BMMs from wild-type and ifnar1−/− mice were treated with 1 μg/ml LPS and protein ISGylation and UBP43 expression was detected by immunoblotting. B, Total RNA was isolated from the macrophages with the same treatment and subjected to Northern blot analysis using cDNA probes for IL-1β, ISG15, UBE1L, UBCm8, and UBP43. Equal loading was evaluated by visualizing 28 S rRNA on the same membrane. One interesting finding was that the protein level of UBP43 reached a maximum level around 4–12 h after LPS treatment and decreased significantly at 24 h, whereas ISG15 conjugates were accumulated over 24 h (Fig. 2⇑A), suggesting that UBP43 is an unstable protein and was degraded shortly after its expression by a proteolytic system. Indeed, UBP43 binds to Skp2 of SCF ubiquitin E3 complex and can be degraded via the proteasome pathway upon ubiquitination (31). 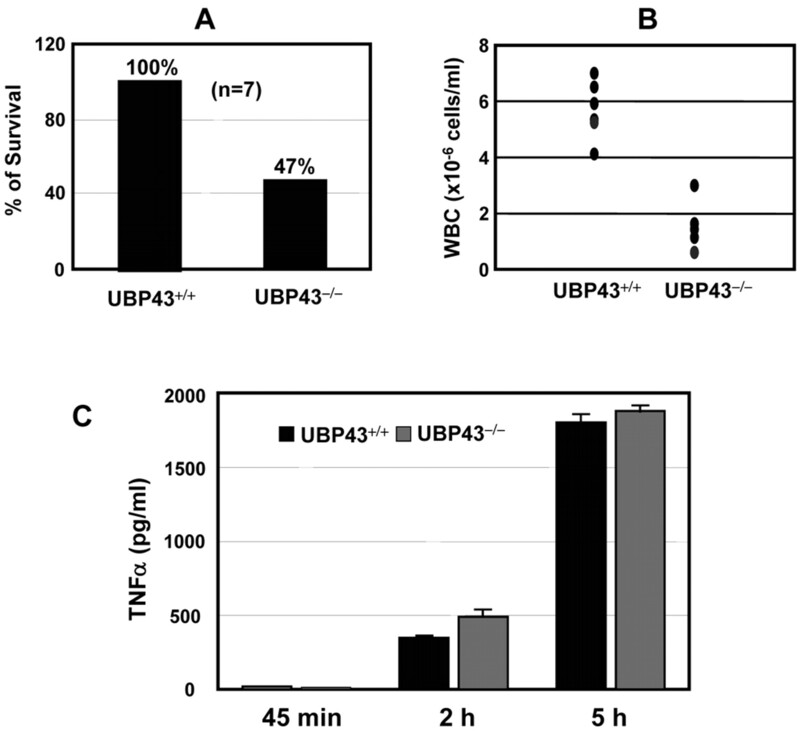 These results suggest that the cellular amount of UBP43 is tightly controlled by both transcriptional and protein stability levels. We previously found that LPS strongly activated the expression of UBP43 and ISG15 and also induced the conjugation of ISG15 to cellular targets in macrophages (32). To test the possible involvement of UBP43 and the protein ISGylation system in endotoxin responses, we injected wild-type and ubp43−/− mice with sublethal doses of LPS (15 mg per kg body weight) i.p. and monitored mouse survival for 5 days. All wild-type mice survived and recovered from the shock within 3 days (Fig. 3⇓A). In contrast, over 50% of ubp43−/− mice died by the same dosage of LPS injection (Fig. 3⇓A), accompanied by damage to multiple organs including the spleen, thymus, and kidneys (data not shown). We also detected a significant decrease in total white blood cells in UBP43-deficient mice upon LPS treatment (Fig. 3⇓B). TNF-α has been known to be a major factor involved in lethality by LPS-induced sepsis (17, 18, 19). We checked TNF-α production in thioglycolate elicited peritoneal macrophages from wild-type and ubp43−/− mice. We did not detect significant differences in the production of TNF-α between wild-type and UBP43-deficient macrophages after LPS administration (Fig. 3⇓C). These results indicate that UBP43 deficiency causes LPS-induced hypersensitivity in mice independent of TNF-α production. LPS hypersensitivity of ubp43−/− mice. A, Five- to 6-wk-old wild-type and ubp43−/− mice (n = 7 for each population) were injected i.p. with 15 mg per kg body weight of LPS. LPS-injected mice were then monitored for 5 days and the percentage of survival was calculated for each genotype. B, The number of total white blood cells in peripheral blood was counted 72 h after the LPS injection. C, Thioglycolate elicited peritoneal macrophages from wild-type and ubp43−/− mice were stimulated with 1 μg/ml LPS for the indicated time. The amount of secreted TNF-α was measured by ELISA and it is a representative result from three independent experiments. Recently, type I IFNs were proposed to be other central factors involved in developing LPS-induced endotoxin shock (20). We previously revealed that UBP43-deficient cells exhibited an elevated response to type I IFN accompanied by hyperphosphorylation of Stat1 and increased expression of ISGs (6). Because we found that LPS-induced UBP43 expression and protein ISGylation are mainly dependent on type I IFN signaling in macrophages, we hypothesized that hypersensitivity of ubp43−/− mice to LPS might be caused by altered sensitivity to type I IFN. We first checked type I IFN signaling in wild-type and UBP43-deficient BMM in response to LPS treatment. Phosphorylation of STAT1 on tyrosine occurred 2–4 h after LPS treatment in wild-type BMM (Fig. 4⇓A). However, in UBP43-deficient BMM, weak STAT1 phosphorylation was detected even before LPS treatment, and became around 4-fold higher compared with wild-type BMM upon LPS treatment. STAT phosphorylation was detectable for over 24 h after LPS treatment. At the same time, substantially stronger protein ISGylation signal was detected in ubp43−/− BMM compared with wild-type BMM before and after LPS treatment. IFN-inducible genes including ISG15, UBE1L, IRF7, and inducible NO synthase genes were also highly expressed in UBP43-deficient compared with wild-type BMM under the same conditions (Fig. 4⇓B). These results indicate that UBP43-deficient BMMs are hyperresponsive to type I IFN signaling upon LPS treatment and this might be a cause of hypersensitivity of ubp43−/− mice to LPS. Hyperactivation of Jak/Stat signaling but normal activation of MyD88-dependent signaling in UBP43-deficient macrophages by LPS. A, BMMs from wild-type (WT) and ubp43−/− mice were treated with 1 μg/ml LPS and the tyrosine phosphorylation of STAT1, STAT1 expression, protein ISGylation and UBP43 expression at indicated time points were detected by immunoblotting. Ponceau staining was used as a loading control. B, The expression of ISGs was detected in wild-type and ubp43−/− BMM upon 1 μg/ml LPS treatment by Northern blotting. The amount of 28 S rRNA was used as a loading control. C, The activation of the MyD88-dependent signaling pathway was examined in LPS-treated BMM derived from wild-type or ubp43−/− mice. The phosphorylated form of each kinase was examined as an indication of the activation of Erk, JNK, and p38 and the unphosphorylated forms were used as equal loading controls. For the activation of NF-κB signaling, the degradation of IκBα was analyzed by immunoblotting. LPS also activates other transcription factors such as AP-1 and NF-κB through MAPKs and IκB kinases, respectively, in a MyD88-dependent manner (25). We analyzed the activation of signaling cascades in wild-type and ubp43−/− BMM upon LPS challenge by detecting the phosphorylation of kinases (ERK1/2, JNK, and p38) or the degradation of IκBα protein for NF-κB signaling. LPS treatment induced the phosphorylation of ERK1/2, JNK, and p38 without any differences between wild-type and ubp43−/− BMM in the intensity and the time course of phosphorylation (Fig. 4⇑C). The LPS-induced degradation of IκBα also showed no difference between wild-type and ubp43−/− BMM as judged by immunoblotting. Taken together, these results suggest that UBP43 deficiency causes hyperactivation of type I IFN-dependent gene expression but does not affect MyD88-dependent signaling pathways upon TLR4 activation by LPS. One characteristic event in macrophages in response to stimulatory molecules such as LPS is the production and release of cytokines and chemokines to initiate inflammatory responses. Because we detected that hyperactivation of type I IFN response resulted in an elevated expression of ISGs upon LPS treatment, we examined the expression of cytokine and chemokine genes in LPS-treated BMM using quantitative RT-PCR. The LPS-induced expression of TNF-α showed a slight but not significant increase in ubp43−/− cells (Fig. 5⇓A), consistent with our previous data from LPS-treated peritoneal macrophages, which showed a similar amount of TNF-α production in wild-type and ubp43−/− macrophages (Fig. 3⇑C). We obtained the same extent of TNF-α expression in wild-type and ubp43−/− macrophages from a short time point (1 h) upon LPS treatment in an independent experiment (data not shown). Interestingly, the IL-1β message level in UBP43-deficient BMM was decreased ∼2-fold over tested time periods of LPS treatment (Fig. 5⇓A). In contrast, we detected a 2-fold increase in IL-1β expression in LPS-treated ifnar1−/− BMM compared with wild-type from Northern blot analysis (Fig. 3⇑C) and also from quantitative RT-PCR (Fig. 5⇓B). 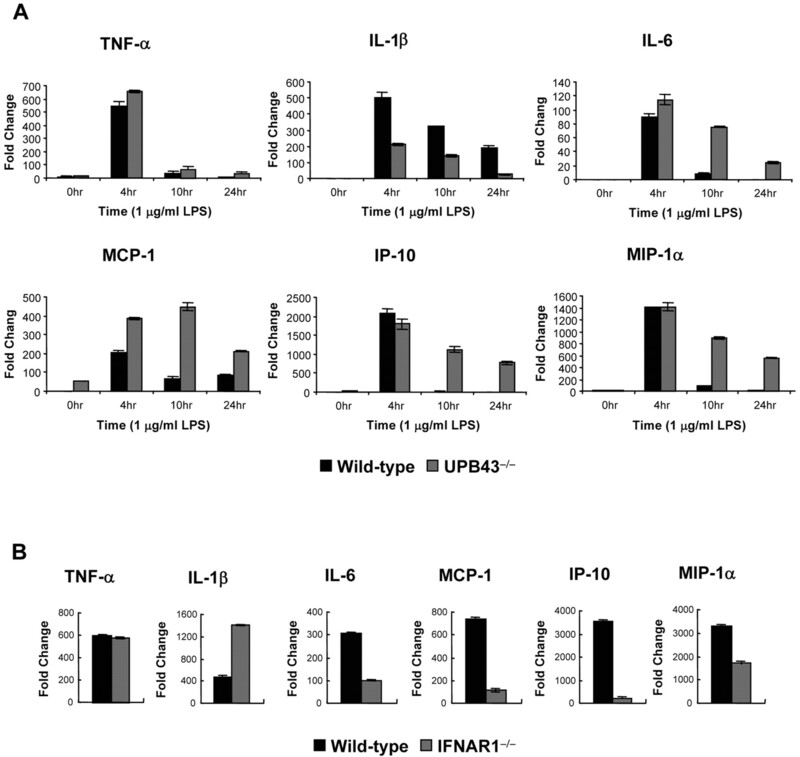 These results indicate that hypersensitivity to type I IFN in UBP43-deficient macrophages causes down-regulation of IL-1β expression during the LPS response. Altered expression of cytokine and chemokine genes in UBP43-deficient macrophages upon LPS treatment. A, BMMs from wild-type and ubp43−/− mice were stimulated with 1 μg/ml LPS for the indicated time periods. The expression of genes was analyzed by quantitative RT-PCR. The fold of induction was calculated by calibrating to 0 h LPS stimulation in wild-type cells. GAPDH gene was used as an internal control for the reaction. B, Gene expression was measured in wild-type and ifnar1−/− BMM treated with 1 μg/ml LPS for 4 h as described. The mRNA levels for cytokine IL-6 and chemokines including MCP-1, IP-10, and MIP-1α in wild-type BMM reached a maximum at ∼4 h after treatment with LPS and rapidly decreased with time to basal levels (Fig. 5⇑A). Initial expression of these genes in UBP43-deficient BMM was comparable to or slightly higher (for MCP-1) than in wild-type BMM at 4 h post LPS challenge. However, a substantial amount of mRNA was still detected even after 24 h of LPS treatment (Fig. 5⇑A). The expression of these genes was impaired in ifnar1−/− BMM treated with LPS (Fig. 5⇑B). Together, these results suggest that type I IFN plays an important role in regulating the production of subsets of cytokines and chemokines, including IL-6, MCP-1, IP-10, and MIP-1α upon LPS treatment. In ubp43−/− macrophages, the production of type I IFN-inducible cytokines and chemokines is prolonged and/or enhanced in accordance with prolonged activation of Jak/Stat signaling. One of the most important roles of macrophages upon bacterial infection along with cytokine and chemokine production is to engulf and degrade invading bacteria to clear the infected host body (33). We analyzed the phagocytic activity of macrophages from wild-type and ubp43−/− mice. Thioglycolate elicited peritoneal macrophages were incubated with a 50-fold excess amount of IgG opsonized zymosan particles, and particle uptake was visualized on the fluorescence microscope. As shown in Fig. 6⇓, certain populations of ubp43−/− macrophages could take up a large number of fluorescent particles (up to 15–18 particles), whereas wild-type macrophages only contained a small number of particles. Average particle numbers for wild-type and ubp43−/− macrophages counted from a total of 200 cells were 3–4 and 7–9, respectively. This result indicates that a subpopulation of ubp43−/− macrophages were preactivated and had an enhanced ability to engulf particles compared with wild-type cells. Enhanced phagocytic activity of UBP43-deficient macrophages. Thioglycolate elicited peritoneal macrophages (1 × 104 cells/well) from wild-type and ubp43−/− mice were plated on eight-well glass slide chambers and allowed to adhere for 1 h at 37°C. Texas Red labeled yeast particles opsonized with mouse IgG (5 × 105 particles, 50 times excess of cell number) were added to the cells and incubated for 1 h at 37°C. Cells were then washed three times with ice-cold PBS and the fluorescence from uningested particles was quenched with 0.4% trypan blue. The fluorescence of the particles in cells was visualized using a fluorescence microscope with ×100 or ×400 magnification. Because we detected hyperactivation of type I IFN-related responses in UBP43 knockout macrophages, we questioned the biological effect of UBP43 deficiency in mice against live pathogens, especially against Gram-negative bacteria. To address this matter, wild-type and ubp43−/− mice were infected with S. typhimurium (∼40 CFU) i.p. and the bacterial load was determined 72 h postinfection from the liver and spleen, which are the major target organs for Salmonella proliferation in the host (34). At the same time, mouse survival was also monitored with the same dose of bacterial infection. At day 3 after Salmonella infection, we detected numerous gray-white lesions on the livers from wild-type mice whereas livers from ubp43−/− mice were relatively free of such lesions (Fig. 7⇓A). Spleens from wild-type mice also showed similar lesions but it was less severe than lesions found in the liver (data not shown). H&E staining of liver sections also showed a significant difference between wild-type and ubp43−/− mice. The morphology of the liver from ubp43−/− mice was quite similar to that of wild-type mice without Salmonella infection except for the presence of many infiltrating immune cells (Fig. 7⇓B). However, as we found lesions in liver of wild-type mice, H&E-stained liver sections also showed large areas of necrotic cell death (Fig. 7⇓B). Bacterial load in the liver and spleen showed significant differences between wild-type and ubp43−/− mice. Bacterial numbers counted from ubp43−/− mice both in the liver and spleen were at least 10-fold lower than the numbers found in wild-type mice (Fig. 7⇓C). These results suggest that ubp43−/− mice can restrict bacterial growth much more efficiently than wild-type mice. Enhanced antibacterial potential in UBP43-deficient mice. Age-matched wild-type and ubp43−/− mice (n = 7 for each genotype) were infected i.p. with ∼40 CFU of S. typhimurium. Livers and spleens were harvested 72 h postinfection. Representative pictures of livers for both genotypes are presented in A. Portions of the livers from infected wild-type and ubp43−/− mice were subjected to paraffin section and stained with H&E (B). Total viable bacterial counts in the liver and spleen were extrapolated from the bacterial counts in the respective tissue samples (C). Survival of wild-type and ubp43−/− mice (n = 6 for each genotype) were monitored after infecting them i.p. with ∼40 CFU of S. typhimurium. The result is expressed as a percentage of survival at times after infection (D). Virulent strains of Salmonella grow in the mouse and finally causes host death even with few numbers of initial infections (34). Surprisingly, the survival rate of ubp43−/− mice with a low dosage of Salmonella infection (∼40 PFU) was not significantly increased compared with wild-type mice. All wild-type mice died within 8 days postinfection and ubp43−/− mice survived slightly longer than wild-type hosts but all died at 11 days postinfection (Fig. 7⇑D). This result indicates that although UBP43 deficiency provided an advantage in protecting the host from bacterial growth, it also caused detrimental effects to the host because of probable hypersensitivity to LPS. The innate immune system is the first line of the host defense against invading pathogens (35, 36). TLRs are now generally accepted as receptors, which recognize pathogen-associated molecular patterns. Among them, TLR4 has been known as a specific receptor of LPS, the cell wall component of Gram-negative bacteria (37). Binding of LPS to TLR4 initiates a signaling cascade to activate transcription factors including NF-κB and IRF3, resulting in the production of immunoregulatory cytokines and chemokines (15). We previously found that LPS induces the expression of ISG15 and UBP43 as well as the conjugation of ISG15 to numerous target proteins in macrophages (32). Thus we questioned whether the protein ISGylation system and UBP43 are involved in the TLR4-mediated host defense mechanism. First we examined which TLR signaling other than TLR4 can activate protein ISGylation and how exactly TLR4 signaling induces protein ISGylation in macrophages. Our experiments revealed that TLR3 and TLR4 are major receptors inducing protein ISGylation in macrophages and that Trif → IRF3 → type I IFN is the main axis for inducing gene expression for the protein ISGylation system and for UBP43 in macrophages upon LPS induction. Interestingly, the ISG15 gene expression pattern showed a biphasic response upon LPS challenge. The expression at the late time period (8–12 h after LPS treatment) comes from the activation of Jak/Stat signaling by type I IFN because ifnar1−/− macrophages have a defect in expressing ISG15 gene at this point. The early expression of ISG15 (2–4 h) is probably induced by IRF3 because it is well known that IRF3 can directly activate ISG15 gene expression upon viral infection (38). In contrast, LPS induction of UBE1L, UBCm8, and UBP43 was mainly dependent on type I IFN signaling. Thus, type I IFN signaling plays a pivotal role in inducing protein ISGylation in macrophages upon LPS treatment. As reported previously, IFN production upon LPS treatment is due to the phosphorylation of IRF3 via a Trif pathway and the induction of NF-κB via a MyD88 pathway (15). We previously generated UBP43 knockout mice to study the biological function of the protein ISGylation system (6, 26). We used this mouse model to investigate the possible involvement of ISGylation or UBP43 in response to LPS-mediated TLR4 signaling. In our experiment, UBP43-deficient mice showed a hypersensitivity to LPS injection, resulting in over 50% death of ubp43−/− mice with a sublethal (for wild-type mice) dose of LPS injection. TNF-α production was almost the same in wild-type and UBP43-deficient macrophages. Instead, we detected hyperactivation of the Jak/Stat signaling pathway in UBP43-deficient macrophages upon LPS treatment characterized by enhanced and prolonged phosphorylation of STAT1 and elevated expression of ISGs. One interesting finding is that several genes for cytokines (IL-6) and chemokines (MCP-1, IP-10, and MIP-1α) were also highly expressed in ubp43−/− macrophages compared with wild-type cells by LPS treatment. Moreover, the expression of these genes were impaired or significantly reduced in ifnar1-deficient macrophages. Cytokine and chemokine production during the inflammatory response is regulated by complicated mechanisms. For example, IL-6 expression by LPS has been known to require at least two transcription factors: NF-κB and the nuclear protein IκBζ (25, 39). Now, our results clearly demonstrated that the type I IFN pathway plays a pivotal role in producing the maximum amount of inflammatory cytokines and chemokines synergistically with other signaling pathways and UBP43 is a crucial component for finishing type I IFN signaling upon LPS challenge. A defect in any one of these signaling molecules causes a significant reduction or overproduction of a subset of cytokines and chemokines. Recently, type I IFN has been identified as a major factor for LPS-induced mouse death (20). UBP43-deficient mice are not able to terminate inflammatory response efficiently due to its intrinsic hypersensitivity to type I IFN. Most probably, this is why UBP43 mice are more susceptible to LPS-induced septic shock compared with wild-type mice. In contrast, the hypersensitivity to type I IFN helps mice to restrict bacterial growth in the body. Salmonella growth in ubp43−/− mice was substantially reduced compared with growth found in wild-type mice. 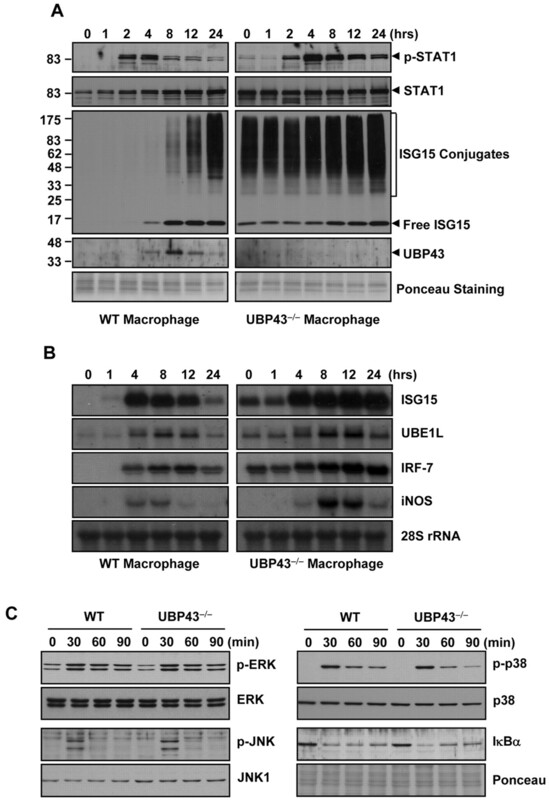 UBP43-deficient macrophages exhibited elevated phagocytic activity, enhanced expression of antibacterial inducible NO synthase as well as cytokine and chemokine genes. All together, hypersensitivity to type I IFN was beneficial to the antibacterial response in ubp43−/− mice. However, survival of ubp43−/− mice was only slightly extended after peritoneal infection of S. typhimurium compared with the wild-type mice. Although ubp43−/− mice can delay bacterial growth, it cannot eradicate the infecting bacteria. Once the bacterial number has reached a certain point, it might cause systemic inflammation, resulting in rapid death of ubp43−/− mice with their intrinsic hypersensitivity to type I IFN, as was the case seen in the LPS-injection experiment. Thus, type I IFN signaling is beneficial to setup an antibacterial state against the Gram-negative bacteria S. typhimurium, though at the same time, it is detrimental to the body without proper termination of the signaling. The mode of action of UBP43 as a negative regulator in type I IFN signaling is similar to that of SOCS-1 in IFN-γ signaling in that both proteins are induced by the signaling pathway and, in turn, function as negative regulators to terminate the signaling process (40). SOCS-1 has been identified as a negative regulator of LPS-induced TLR4 signaling as well (41, 42, 43). The socs-1−/− mouse itself, or with an IFN-γ-deficient background, is hypersensitive to LPS-induced lethal effects as are the ubp43−/− mice. However, the mechanism whereby SOCS-1 deficiency causes LPS hypersensitivity is controversial. Two groups claimed that SOCS-1 directly suppresses LPS-induced NF-κB activation (41, 42) but recently another group has found that type I IFN signaling but not NF-κB signaling is a target of SOCS-1 upon LPS treatment (43). It is clear that UBP43 is a specific negative regulator for type I IFN signaling because we did not detect any changes in the activation of MyD88-dependent TLR4 signaling by LPS. More importantly, the proper termination of type I IFN-signaling by UBP43 is a critical requirement to prevent over-activation of TLR4 signaling by LPS. In the absence of UBP43, cells accumulate much higher levels of ISGylated proteins. To date, only five cellular targets for protein ISGylation have been reported, including Serpin 2a, Jak1, Stat1, phospholipase Cγ1, and Erk1/2 (28, 44), among possibly hundreds of ISGylated proteins. We recently report that UBP43-deficient mice are resistant to certain virus infections (45). Currently, it is not clear how protein ISGylation contributes to innate immunity. Further identification of ISG15 targets and intensive studies for the consequence of ISGylation of these target proteins will eventually provide molecular explanation of how protein ISGylation is involved in innate immune responses against bacterial and viral infection. In conclusion, UBP43, a deconjugating enzyme for the protein ISGylation system, is a crucial component in endotoxin-induced inflammatory responses by terminating type I IFN signaling. Deficiency of UBP43 causes hypersensitivity to LPS-induced sepsis. ubp43−/− mice could restrict Salmonella growth more efficiently than wild-type mice, though survival rates of ubp43−/− mice were only slightly extended after Salmonella infection as compared with the wild-type mice, the most likely reason being the intrinsic hypersensitivity to LPS in the ubp43−/− mice. These results clearly demonstrate a good model that the tight regulation of cytokine signaling is critical to protect the host from harmful overresponse to inflammatory signaling, which may have lethal effects. We thank Drs. Michel Aguet (Swiss Institute for Experimental Cancer Research, Lausanne, Switzerland) and Shizuo Akira (Department of Host Defense, Research Institute for Microbial Diseases, Osaka University, Osaka, Japan) for ifnar1−/− and myd88−/− mice, respectively, Drs. Li Li and Chang Hahn (Aventis Pharmaceuticals, Bridgewater, NJ) for technical assistance, and Dr. Herbert Virgin (Washington University School of Medicine, St. Louis, MO) and members of the Zhang laboratory for valuable discussions and critical reading of the manuscript. ↵1 This work is supported by National Institutes of Health Grant CA079849 (to D.E.Z.) and GM060031 (to B.B.). The Stein Endowment Fund has partially supported the Molecular and Experimental Medicine Departmental Molecular Biology Service Laboratory for DNA Sequencing and Oligonucleotide Synthesis. This is manuscript no. 17087-MEM from The Scripps Research Institute. ↵2 Current address: Department of Biological Science, Sookmyung Women’s University, 53-12 Chungpa-dong 2 Ka, Yongsan-gu, Seoul 140-742, Korea. ↵4 Abbreviations used in this paper: ISG, IFN-stimulated gene; BMM, bone marrow-derived macrophage; ISGylation, ISG15 protein conjugation; IRF, IFN regulatory factor; SOCS, suppressor of cytokine signaling; m, murine; IP-10, IFN-γ-inducible protein-10, Trif, TIR domain-containing adapter inducing IFN-β. Samuel, C. E.. 2001. Antiviral actions of interferons. Clin. Microbiol. Rev. 14: 778-809. Pestka, S., J. A. Langer, K. C. Zoon, C. E. Samuel. 1987. Interferons and their actions. Annu. Rev. Biochem. 56: 727-777. Der, S. D., A. Zhou, B. R. Williams, R. H. Silverman. 1998. Identification of genes differentially regulated by interferon α, β, or γ using oligonucleotide arrays. Proc. Natl. Acad. Sci. USA 95: 15623-15628. Shuai, K., B. Liu. 2003. Regulation of JAK-STAT signalling in the immune system. Nat. Rev. Immunol. 3: 900-911. Malakhova, O. A., M. Yan, M. P. Malakhov, Y. Yuan, K. J. Ritchie, K. I. Kim, L. F. Peterson, K. Shuai, D. E. Zhang. 2003. Protein ISGylation modulates the JAK-STAT signaling pathway. Genes Dev. 17: 455-460. Loeb, K. R., A. L. Haas. 1992. The interferon-inducible 15-kDa ubiquitin homolog conjugates to intracellular proteins. J. Biol. Chem. 267: 7806-7813. Kim, K. I., D. E. Zhang. 2003. ISG15, not just another ubiquitin-like protein. Biochem. Biophys. Res. Commun. 307: 431-434. Hochstrasser, M.. 2000. Evolution and function of ubiquitin-like protein-conjugation systems. Nat. Cell Biol. 2: E153-E157. Pickart, C. M.. 2001. Mechanisms underlying ubiquitination. Annu. Rev. Biochem. 70: 503-533. Yuan, W., R. M. Krug. 2001. Influenza B virus NS1 protein inhibits conjugation of the interferon (IFN)-induced ubiquitin-like ISG15 protein. EMBO J. 20: 362-371. Malakhov, M. P., O. A. Malakhova, K. I. Kim, K. J. Ritchie, D. E. Zhang. 2002. UBP43 (USP18) specifically removes ISG15 from conjugated proteins. J. Biol. Chem. 277: 9976-9981. Zhao, C., S. L. Beaudenon, M. L. Kelley, M. B. Waddell, W. Yuan, B. A. Schulman, J. M. Huibregtse, R. M. Krug. 2004. The UbcH8 ubiquitin E2 enzyme is also the E2 enzyme for ISG15, an IFN-α/β-induced ubiquitin-like protein. Proc. Natl. Acad. Sci. USA 101: 7578-7582. Kim, K. I., N. V. Giannakopoulos, H. W. Virgin, D. E. Zhang. 2004. Interferon-inducible ubiquitin E2, Ubc8, is a conjugating enzyme for protein ISGylation. Mol. Cell. Biol. 24: 9592-9600. Cohen, J.. 2002. The immunopathogenesis of sepsis. Nature 420: 885-891. Beutler, B., I. W. Milsark, A. C. Cerami. 1985. Passive immunization against cachectin/tumor necrosis factor protects mice from lethal effect of endotoxin. Science 229: 869-871. Rothe, J., W. Lesslauer, H. Lotscher, Y. Lang, P. Koebel, F. Kontgen, A. Althage, R. Zinkernagel, M. Steinmetz, H. Bluethmann. 1993. Mice lacking the tumour necrosis factor receptor 1 are resistant to TNF-mediated toxicity but highly susceptible to infection by Listeria monocytogenes. Nature 364: 798-802. Karaghiosoff, M., R. Steinborn, P. Kovarik, G. Kriegshauser, M. Baccarini, B. Donabauer, U. Reichart, T. Kolbe, C. Bogdan, T. Leanderson, et al 2003. Central role for type I interferons and Tyk2 in lipopolysaccharide-induced endotoxin shock. Nat. Immunol. 4: 471-477. Nau, G. J., A. Schlesinger, J. F. Richmond, R. A. Young. 2003. Cumulative Toll-like receptor activation in human macrophages treated with whole bacteria. J. Immunol. 170: 5203-5209. Gao, J. J., V. Diesl, T. Wittmann, D. C. Morrison, J. L. Ryan, S. N. Vogel, M. T. Follettie. 2002. Regulation of gene expression in mouse macrophages stimulated with bacterial CpG-DNA and lipopolysaccharide. J. Leukocyte Biol. 72: 1234-1245. Ritchie, K. J., M. P. Malakhov, C. J. Hetherington, L. Zhou, M. T. Little, O. A. Malakhova, J. C. Sipe, S. H. Orkin, D. E. Zhang. 2002. Dysregulation of protein modification by ISG15 results in brain cell injury. Genes Dev. 16: 2207-2212. Hoebe, K., X. Du, P. Georgel, E. Janssen, K. Tabeta, S. O. Kim, J. Goode, P. Lin, N. Mann, S. Mudd, et al 2003. Identification of Lps2 as a key transducer of MyD88-independent TIR signalling. Nature 424: 743-748. Malakhov, M. P., K. I. Kim, O. A. Malakhova, B. S. Jacobs, E. C. Borden, D. E. Zhang. 2003. High-throughput immunoblotting: ubiquitiin-like protein ISG15 modifies key regulators of signal transduction. J. Biol. Chem. 278: 16608-16613. Tokarz, S., C. Berset, J. La Rue, K. Friedman, K. Nakayama, K. Nakayama, D. E. Zhang, S. Lanker. 2004. The ISG15 isopeptidase UBP43 is regulated by proteolysis via the SCFSkp2 ubiquitin ligase. J. Biol. Chem. 279: 46424-46430. Malakhova, O., M. Malakhov, C. Hetherington, D. E. Zhang. 2002. Lipopolysaccharide activates the expression of ISG15-specific protease UBP43 via interferon regulatory factor 3. J. Biol. Chem. 277: 14703-14711. Sansonetti, P.. 2001. Phagocytosis of bacterial pathogens: implications in the host response. Semin. Immunol. 13: 381-390. Richter-Dahlfors, A., A. M. Buchan, B. B. Finlay. 1997. Murine salmonellosis studied by confocal microscopy: Salmonella typhimurium resides intracellularly inside macrophages and exerts a cytotoxic effect on phagocytes in vivo. J. Exp. Med. 186: 569-580. Beutler, B.. 2004. Innate immunity: an overview. Mol. Immunol. 40: 845-859. Finlay, B. B., R. E. Hancock. 2004. Can innate immunity be enhanced to treat microbial infections?. Nat. Rev. Microbiol. 2: 497-504. Nakaya, T., M. Sato, N. Hata, M. Asagiri, H. Suemori, S. Noguchi, N. Tanaka, T. Taniguchi. 2001. Gene induction pathways mediated by distinct IRFs during viral infection. Biochem. Biophys. Res. Commun. 283: 1150-1156. Yamamoto, M., S. Yamazaki, S. Uematsu, S. Sato, H. Hemmi, K. Hoshino, T. Kaisho, H. Kuwata, O. Takeuchi, K. Takeshige, et al 2004. Regulation of Toll/IL-1-receptor-mediated gene expression by the inducible nuclear protein IκBζ. Nature 430: 218-222. Kinjyo, I., T. Hanada, K. Inagaki-Ohara, H. Mori, D. Aki, M. Ohishi, H. Yoshida, M. Kubo, A. Yoshimura. 2002. SOCS1/JAB is a negative regulator of LPS-induced macrophage activation. Immunity 17: 583-591. Nakagawa, R., T. Naka, H. Tsutsui, M. Fujimoto, A. Kimura, T. Abe, E. Seki, S. Sato, O. Takeuchi, K. Takeda, et al 2002. SOCS-1 participates in negative regulation of LPS responses. Immunity 17: 677-687. Gingras, S., E. Parganas, A. de Pauw, J. N. Ihle, P. J. Murray. 2004. Re-examination of the role of SOCS1 in the regulation of Toll-like receptor signaling. J. Biol. Chem. 279: 54702-54707. Hamerman, J. A., F. Hayashi, L. A. Schroeder, S. P. Gygi, A. L. Haas, L. Hampson, P. Coughlin, R. Aebersold, A. Aderem. 2002. Serpin 2a is induced in activated macrophages and conjugates to a ubiquitin homolog. J. Immunol. 168: 2415-2423. Ritchie, K. J., C. S. Hahn, K. I. Kim, M. Yan, D. Rosario, L. Li, J. C. de la Torre, D. E. Zhang. 2004. Role of ISG15 protease UBP43 (USP18) in innate immunity to viral infection. Nat. Med. 10: 1374-1378.